Since I published it over two years ago, Ottery Goodness, which deals with the Hutchinson (Kansas) Zoo's otters, has been one of my more popular posts. Fans of Kyra (right) and Willy the otters will be amused to know that Kyra had a little adventure of late, but is now re-united with Willy, who apparently missed her. 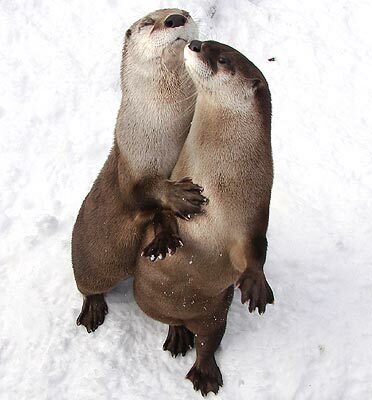 Today's Hutchinson News details Kyra's escape on Valentines Day (which, apparently otters do not dedicate to togetherness) and subsequent return this past Sunday after an 8-day adventure. Alas for romantic in us all, it was not ottery amour - nor even...uh...the sweet smell of Willy's manure - that lured Kyra back home. Zookeeper Heather Ladd lured her back with a hard-boiled egg. See a video of Kyra and Willy frolicking in last month's Afternoon at the Hutchinson Zoo. One lesson learned from this ordeal was to never underestimate the power of the incredible edible egg. She'll be back in the aviary later this week, (in her newly reinforced exhibit). I'm sure she'd love to see you again Ace! !